To sign up to the Super Camps - Kids Camps Newsletter, simply click the Request Newsletter button below and you will receive amazing special offers, discounts and access to secret sales. 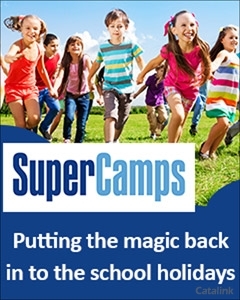 Super Camps is the UK's No.1 Holiday childcare provider for children aged between 4 and 14 years. We have been entertaining children and reassuring parents at our activity camps for 20 years, and run at over 80 schools in fantastic and convenient locations. Super Camps holiday childcare runs at 79 locations across the UK, meaning that close–to–home childcare is never far away. With over 40 different activities to choose from throughout the week, ranging from football to archery to quad biking and swimming, you can be sure this is the best way to look after your children during the holidays. To give your kids a treat (and yourself a break) sign up to the Super Camps eNewsletter for offers, news & savings. By Pressing the Request Newsletter button you give Super Camps - Kids Camps (and their Data Processors for the specific purpose of delivering your emails) consent to send you their newsletter via email until such time as you choose to unsubscribe.